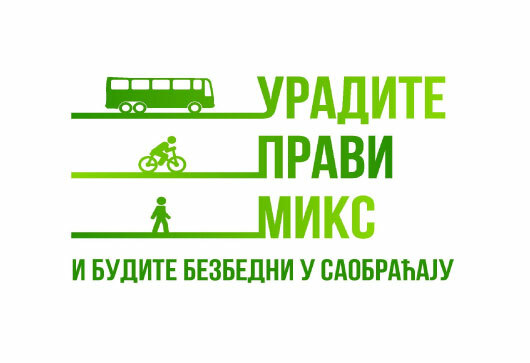 Do the right mix – the main objective of the projects was to promote the safe use of sustainable transport for the citizens of Belgrade and the promotion of the EUROPEAN MOBILITY WEEK. Results of the project: EcoDev created and distributed brochures with maps of bicycle paths and public transport for the municipalities of Zemun and Novi Beograd – in total 40.000 maps; 10 workshops about the sustainable use of transport were organised for 10 secondary schools for 200 pupils in the territory of New Belgrade and Zemun and 2 panel discussions were organised in the Municipality of New Belgrade and Zemun for 100 participants. A contest was organised for the best story and photos of combined use of transport. The awards were bicycles. The project was supported by the: Secretariat for transport of the city of Belgrade.